Classic Burley Kake in a MM cob. On the back porch again because it so "just right." Enjoying "Legacy" in my 1933 Dunhill Billiard with a nice glass of Miles Finest Rainwater Medium Dry Madeira. Old Dark Fired in a French Kriswill Danish Clipper I picked up from a widow not too long ago. This tobacco never gets old, especially in a worthy piece of briar and paired with a Maker's Mark mint julep--borrowed a buddy of mine's vintage ice crusher, which makes all the difference! HU Director's Cut in a smooth 1976 Canadian GBD Seventy Six 256. Sherlock Holmes VR blend in my Pete Silver System 307 after work. Right now after supper some P&W Churchill in a Mastro Poker. Got some 5100 ready next, in my Stanny Legend 19. Having a bowl of Orlik Golden Sliced in one of my claw/egg meers while watching all thetornadoes all around us tonight. This blend really sings in a meer !! Tonight I mixed one part Altadis Frosty Mint with two parts Altadis Maraschino and smoked it in my "Mammy Yoakum" antique cane-stemmed cob. This was a really good combination of tobacco and pipe although the mint petered out before the cherry halfway through the bowl. A glass of Maker's 46 on the rocks topped it off. All made for a most-mellow evening. MacBaren Plum Cake in a 1975 medium bend sandblasted looking, smooth on the sides yellow Pioneer meer. Almost done smoking Anniversary Kake in a 1979 Chippendale (Charatan second) Rhodesian 49. Angler's Dream in a 2003 black grain relief medium bend Karl Erik Ekstravagant freehand sitter with a smooth rim. Just finishing up a late night smoke and my last bowl of the night. FMOTT in my Piersel short apple blast. Thank you Scottie! To tuck up my head. Is rocking her tired little babies to rest. 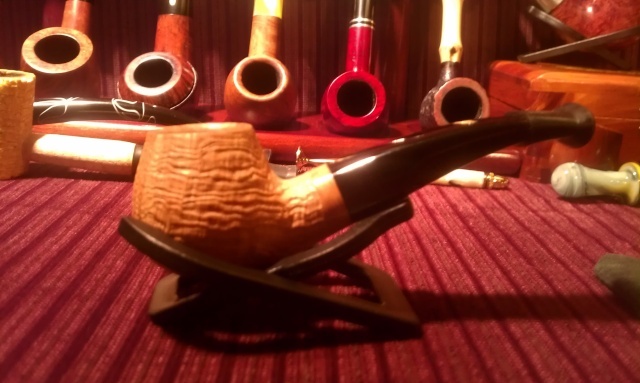 Astley's 55 in an early Radice Rind three quarter bend sandblast egg with a bamboo-style carving on the shank. Emp in an Askwith morta bulldog. Black coffee on the side. Margate in a MM cob for my commute. Virginia Spice in a straight Lane era Charatan black with burgundy undertone sandblasted billiard 420. The current tinned version of Three Nuns in a straight black sandblast 2 star Ferndown Bark Prince with a Cumberland stem.